It’s kind of amusing that our last episode was two weeks ago and that it was titled “Never Again”, as though we never intended to release another episode of EnderCast. Really though, what happened was that the original Episode 22, Red Yellow Yellow, never happened because Kelly and I couldn’t find the time to schedule it. And then when we did, my internet crapped out. So here we are with Episode 22, Launchies in Line, recorded at Comic Con from the Hall H line! We were happily joined by Hannah Craswell and Aidan Vitti as well. 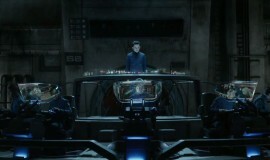 We’ve got two more episodes to post, one of which includes a whopping eight guests from the cast of Ender’s Game! Awesome episode! I seriously can’t wait to see all those new pictures! Having read up on everything SDCC in the past couple of days, I may clear up a few things (or not). – In the video of Asa, Hailee, Gavin and Bob going throught he experience, Gavin says that the round porthole thing that you could sit it is the window out of Ender’s commander’s quarters. Hope to see new episodes, images and whatever you have to share soon! PS: Your Pop Quiz standings still need to be updated!